This trip was decided almost 2 weeks ago and the tickets were booked a week prior to the journey however, I was still in two minds to visit Mumbai. It was not until the last moment that I made up my mind and headed to Mumbai. Booking a ticket for my ride back home always remains a dilemma and will continue to remain the same. As always bus connectivity between Mumbai and Bangalore is immense and choosing a best operator is difficult. However, I had a different kind of confusion this time. Since once of my very well know crew was plying the 15:30 schedule in KSRTC, without further delays I booked a ticket and eagerly awaited to meet them. 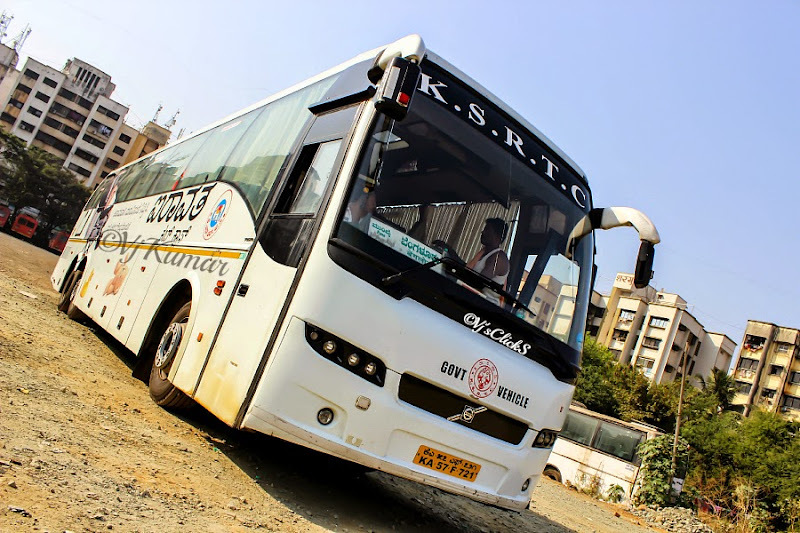 Choosing KSRTC was a brave call as many who have traveled know the time it takes to cover the journey. While some criticize for the speed at which these buses are driven, few others criticize for the time taken for such a long journey. I headed straight to Nancy colony after calling up the crew. I was greeted with my bus fresh out from bath. After stashing the luggage, I headed straight into the belly for a brief nap. After a couple of minutes it was lunch time post which we began our preparation for our journey. While the crew prepared for the journey, I went ahead for some quick snaps of our beauties resting under the sun. 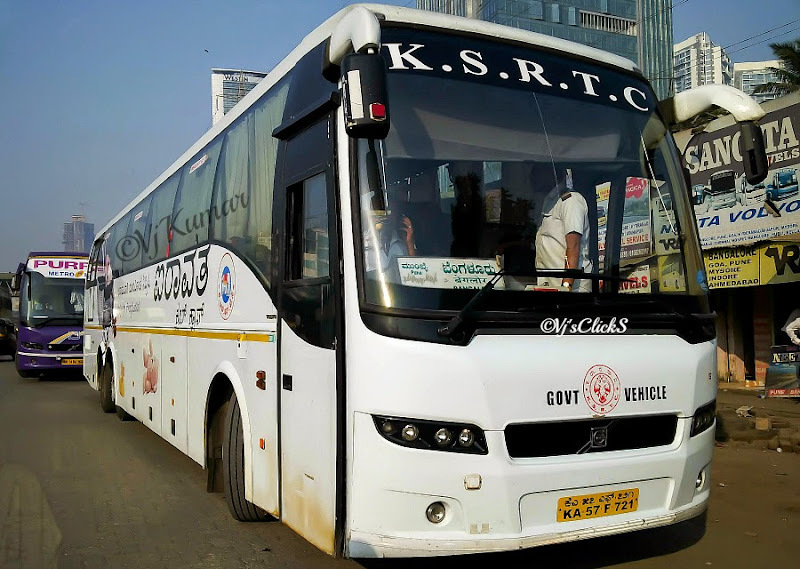 The bus headed out of the Nancy bidding adieu to a resting Mysore-Mum Club class and a Belagavi-Mumbai Club class (Goldie). While we headed towards Gokul hotel, the sensuous SRS Scania passed by on the opposite side. We pulled over at Gokul hotel and we were joined by a SRS and CPT (new bus) B9r heading towards Mangalore. They both left as soon as they came and after a couple of minutes we headed towards Dahisar. We were joined by our pickup man here. The bus was running almost full with last row seats being empty. Most of the passengers were boarding from Vashi however a couple of them were from Andheri and Chembur. We reached Chembur and waited for a passenger who was waiting at a different location. After a long wait he showed up with a ‘Sorry sir’ message. The crew was left fuming at this point however held back the frustration and drove on. Luckily traffic was thin as we headed towards Chembur. We were joined by CPT 9r and a VRL B9R sleeper. Our pickup man bid adieu here as made our way quickly toward Vashi. Most of the passengers boarded our bus here. Finally, we exited Mumbai heading towards Panvel. 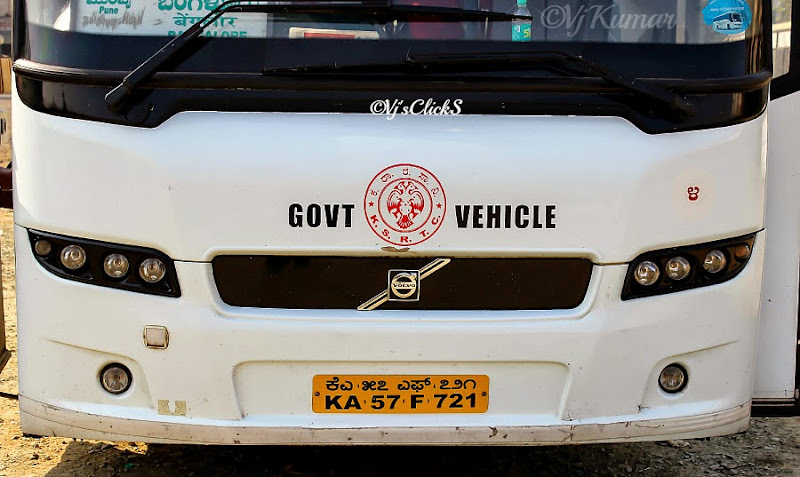 The ride was typical KSRTC standards, slow and smooth cruising at 90kmph. While a recent Bollywood flick kept the passengers entertained, I joined the crew up ahead to enjoy the scenic expressway. We pulled over at the Food mall for a quick tea break. The break was very brief and we rejoined the highway. While the crew did what best they always did, I decided to do the best thing I am good at, Sleep. 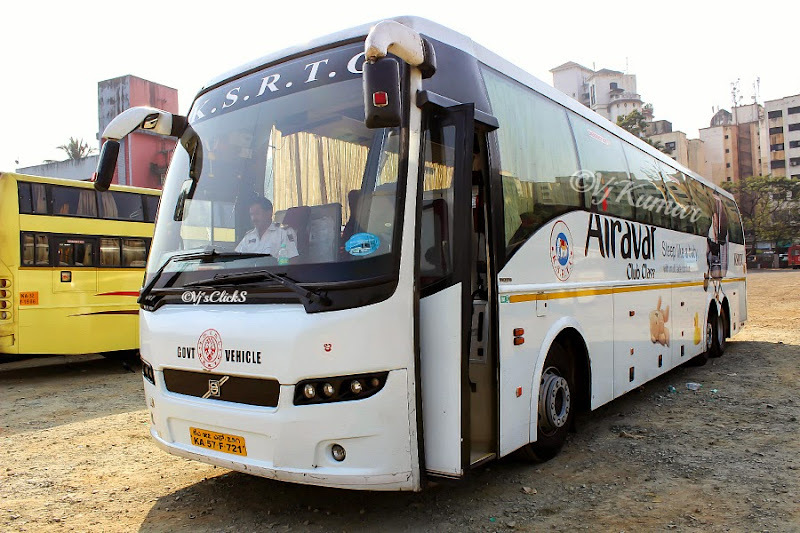 The comfort and ride quality ensure I slept away to glory while the bus covered the expressway entering Pune. I rarely remember waking up in wakad and then again in Swargate, Pune at around 9pm. I slept back into sleep again only to be woken up at Hotel Natraj for our Dinner break. We were quickly joined by a VRL 9R while National’s ‘Mumtaz Mahal’ Scania raced passed us. While we prepared to resume our journey, Sharma B9R entered for her dinner break. Back on the highway, I made my way back to the Emergency exit row seats as both the seats were empty. I decided to continue my nap hoping to join the ride upfront in Hubli. I woke up to see Haveri welcoming us at around 4:30am. The crew change had just happened and I joined them up ahead. We were following a string of B9R’s headed by VRL B9r sleeper. We were playing cat and mouse games with a Sharma B9R sleeper who was cruising at almost the same speeds that we were doing. We quickly reached Davangere and pulled over to drop passengers. At this juncture, the Sharma B9r overtook us with the driver waving at us with a smile. We resumed our journey and as we neared Chitradurga, we spotted the same guy dropping his passengers on the highway. We entered Hotel Athithi , the designated stop for all KSRTC buses. I was pretty skeptical about this place as I had a very bad experience at this place the last time. However, I was surprised to see things had changes a lot. The restrooms were maintained very well and the food was also much better. We were joined by a B7R heading towards Davangere. 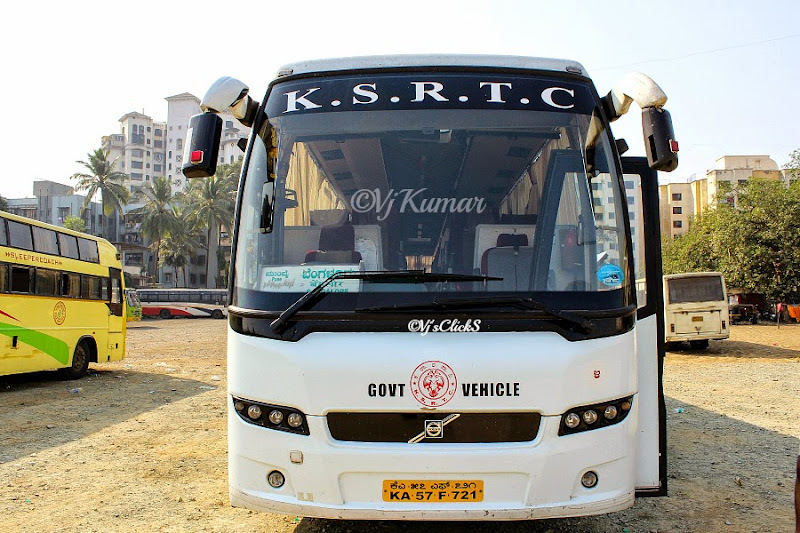 I had mentioned the same earlier too, the only reason I opted for KSRTC is for the friendly crew. 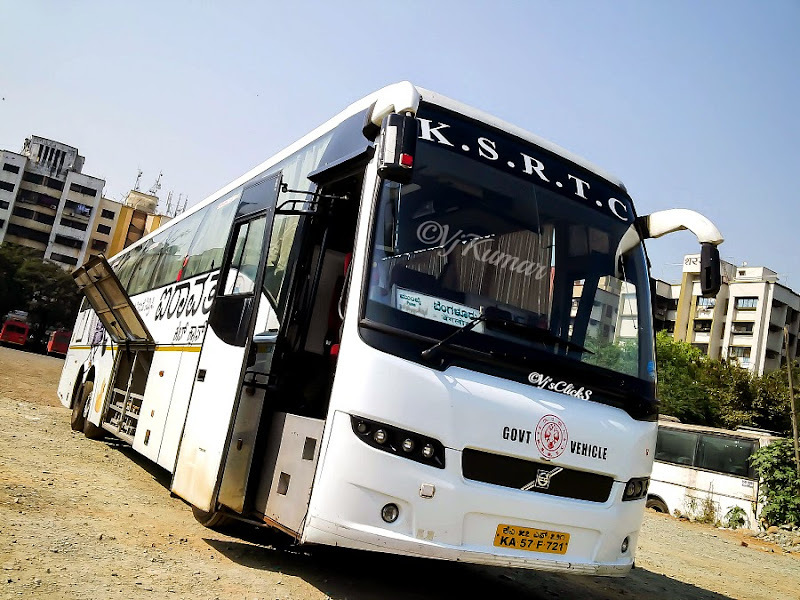 Indeed the journey time was long however a comfortable ride is always promised from KSRTC. 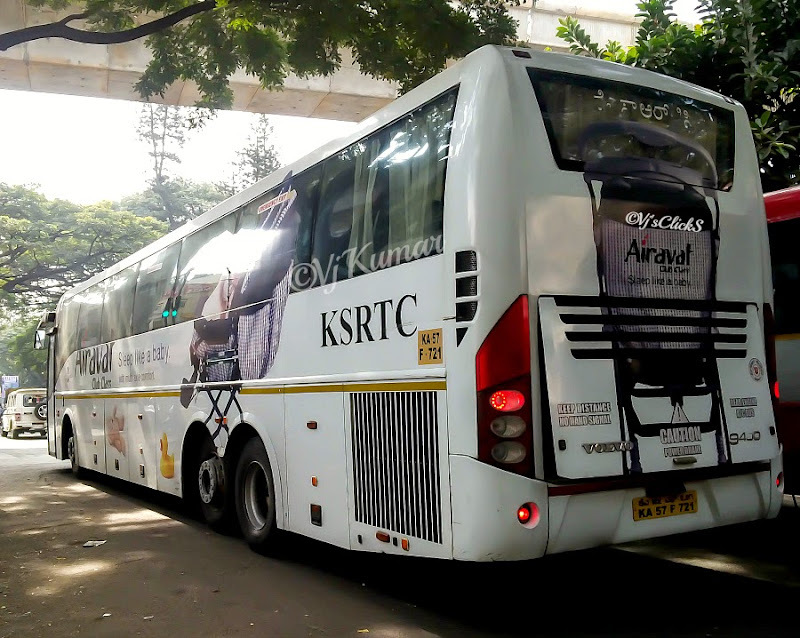 This was the second time I opted for KSRTC and was certainly not disappointed. This ride is definitely not for the ones who prefer speed as the main criteria for a journey.